BUILDing A Name for Ourselves: Students share their experiences at Faculty Retreat. 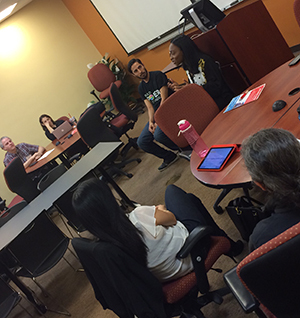 On Tuesday, January 19th 2016 two BUILD PODER Scholars, Jose Estrada and Chiemelie Onyekonwu, were invited to present at the annual winter faculty retreat "Rediscovering CSUN" alongside Dr. Frankline Augustin, BUILD PODER Faculty Mentor, and Dr. Carrie Saetermoe, BUILD PODER PI and Research Enrichment Core Program Director. The faculty in attendance heard from Jose and Chiemelie about their diverse backgrounds, life as BUILD PODER students, challenges they have overcome, and how BUILD PODER has helped them reach new confidence in the classroom, in their lab, and in life in general. They shared anecdotes of breakthroughs they had with their faculty mentors and the comradery within their cohort. Faculty from all disciplines listened intently and at the end of the session there was a question and answer portion where our students gave their input on how professors can better serve their students in the classroom and how to better hone in on their mentoring skills. Overall, it was a very enlightening afternoon and we are incredibly proud of the professionalism and insight BUILD PODER students were able to share. In early January 2016, scholars in the CSULB BUILD program had the opportunity to participate in a week-long workshop in preparation for the GRE, a standardized test that is an admissions requirement for most graduate schools in the United States. "The course definitely met my expectations. I feel more confident on taking the GRE" one scholar said after taking the GRE preparation course." The workshop was taught by David White, a representative of the test preparation company Testing for the Public. A graduate of Harvard Law School, White has been immersed in the study of standardized testing for 30 years. As early as 1979, he testified before the New York State legislature urging passage of "Truth in Testing" legislation that would require admission tests to be made public. He is a noted voice for greater equity in standardized testing, and has been a featured speaker at the national conventions of the Association of American Law Schools, the Society of American Law Teachers, and the National Conference of Black Lawyers. "He's extremely knowledgeable about the GRE course material and has a great ability to communicate the material effectively," another scholar said of White. The course was highly interactive and provided a variety of techniques for solving problems on the exam. Every scholar in the class had the opportunity to participate and was provided a safe learning environment. "The course challenged my thought process and I learned from the people around me through open group discussion," a participant said. Another mentioned, "He went over every problem and made sure we all understood, as well as explained why answers were wrong." Study materials, both preparation books and online resources. Drop-in vocabulary tests given every week. 30-minute prep tests, including verbal and quantitative reasoning questions, given every other week. Scholars are encouraged to form "study pods" of three to four members. To foster friendly competition, each pod will choose a name for their group and the group's scores (not individual scores) on tests will be posted at the Student Center. "We're making every effort to give our scholars the support they need to move on to graduate school and pursue their research career successfully," said Chi-Ah Chun, Ph.D., Director of the Student Training Core for CSULB BUILD Program. "This GRE prep program is just one example of [how] we do that." On Thursday, January 21st, 2016, ASCEND joined with the Research Initiative for Scientific Enhancement (RISE) program to host its annual Survival Skills/Responsible Conduct of Research Workshop. The workshop was originally planned for two days, but was shortened due to an impending blizzard that dropped two feet of snow in one day. Despite the compressed agenda, the students gleaned much from these workshops, which will prepare them to conduct the research projects they designed, as well as establish some basic expectations for what they will experience when they embark on their own doctoral programs. Mr. Kevin Morris and Ms. Annie McPherson (from Emory University) share their doctoral program experiences with the ASCEND and RISE scholars. The path near Morgan State University's Richardson Library, following the 1-23-16 blizzard that dropped two feet of snow on Baltimore in one day. BUILD EXITO Peer Mentors Contribute Many Things to Our BUILD Community! In the BUILD EXITO program, each scholar is paired with a peer mentor. Our peer mentors, who are upperclassman at one of our four-year institutions, went through a competitive application and interview process and were selected for demonstrating a commitment to equity and diversity in scientific research and showing promise to successfully support our scholars. Peer mentors serve as guides to student life and success, helping EXITO scholars connect to campus cultural activities, groups and programs, as well as navigate university services such as housing, financial aid and recreation. They also have committed to share personal insights and counsel scholars on how best to take advantage of EXITO courses, resources and research experiences. Because BUILD EXITO scholars are spread across nine different colleges and universities, the peer mentoring relationship is a crucial aspect of support for our scholars, many of whom will be transferring from community colleges to four year universities while in the program. Using adapted materials from the NRMN Entering Mentoring Curriculum, each peer mentor went through a series of onboarding training to prepare for these relationships. PSU is grateful for the 15 incredible peer mentors who have dedicated themselves to supporting scholars for the duration of the 2015-2016 academic year. These individuals represent diverse groups and experiences and bring a rich and valuable perspective to our EXITO community. Many have worked hard to forge a successful pathway into research for themselves and are pursing a wide variety of research topics including developmental neurobiology of attention deficit hyperactivity disorder and autism, aging services in rural Oregon, health disparities in immigrant and minority populations, cancer therapeutics, nerve-specific fluorophores for use in image-guided surgery, and many others. The travel opportunities that EXITO offers to scholars and peer mentors allows them to engage with the boarder community of researchers who are examining health related topics. These experiences have already added much value to their collective dialogue about the relevance of the work. One of our peer mentors, Kimberly Gottschalk, had a chance to travel to American Geophysical Union's (AGU) fall meeting in December and to participate in a new AGU mentoring program which matches undergraduates with researchers across the country. Kimberly, a double major in Environmental Science and Biology with a minor in Physics, is planning to apply to PhD programs in Physical Oceonography. She chose to share what she learned through her conference experience by creating a video blog of each day. She recorded and uploaded these videos and you can view them by clicking on the following links for day 1, 2, 3, 4, and then a wrap up. 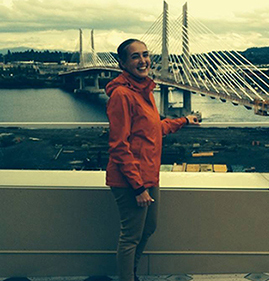 PSU is glad that Kimberly took the time to share her BUILD EXITO experiences! PSU is also grateful for the peer mentors and their commitment to the EXITO scholars. Their relationship is key to the students' success. The travel opportunities that BUILD EXITO provides for scholars and peer mentors are not only beneficial for those individuals, but also for our greater community. There is much excitement at PSU to see what future scholars will learn and discover as they deepen their connection with peers and engage in experiences with the broader scientific community. Three upper division UTEP students and their respective faculty mentors have been selected as the first participants of the Research and Teaching Integration (RTI) Program, sponsored by the BUILDing SCHOLARS Center and funded by the National Institutes of Health, for the 2016 calendar year. Participants include fellow Atzimba Casas, junior, cellular & molecular biochemistry, and mentor Dr. Binata Joddar, department of mechanical engineering; fellow Jennie Choi, senior, biochemistry, and mentor Dr. Chuan (River) Xiao, department of chemistry; and fellow Gabrielle Mendoza, senior, sociology and political science, and mentor Dr. Sara Grineski, department of sociology and anthropology. This competitive program provides undergraduate scholars at UTEP with the ability to translate their mentored-research findings into laboratory and/or classroom teaching modules, practice the art of teaching, and improve their training and skills in preparation for graduate school, biomedical teaching careers or the biomedical workforce. "We are very excited about the expeditious launching of the BUILD RTI Program this semester. We strongly believe that it will add tremendous value to the fellows' undergraduate research experience, and it will offer their faculty mentors a unique opportunity to contribute to the training (of)the next generation of effective teachers," Dr. Homer Nazeran, BUILD co-PI and professor of electrical and computer engineering, said of the program. RTI fellows receive a $1,500 travel stipend to present the outcomes of their RTI fellowship at a national or regional educational or mentoring conference, as well as a $600 stipend for materials and supplies. Click here to read more about the 2016 RTI projects, mentors, and scholars. To expand and enhance mentor and mentee training at BUILD institutions and other institutions nationwide, NRMN offered two train-the-trainer facilitator training workshops in early 2015. The workshops, Facilitating Mentor and Mentee Training, were held at the University of Minnesota (a NRMN hub site) on February 26-27, 2015 and at the University of San Diego on May 18-19, 2015. A total of 76 participants attended these workshops, representing the 10 BUILD primary sites, 13 BUILD partner sites and 14 non-BUILD institutions. During the workshops, participants learned about evidence-based approaches to mentor and mentee training, gained the knowledge, confidence, and facilitation skills needed to implement training, and developed implementation plans for delivering training programs at their own institutions. Participants focused on Entering Mentoring-based curricula, including mentor training for the mentors of undergraduate students, graduate students, junior faculty and post-doctoral fellows, and on mentee training for undergraduate students based on the Entering Research curriculum. Although all workshop attendees shared the same goal of implementing training on their campuses, attendees varied in their goals for which type of implementation they wanted to facilitate. For example, participants varied in their training curriculum focus, targeted career stage of attendees, and duration of implementation. The interactive and practice-based nature of the workshop addressed these goals, especially with tailored sessions where attendees could practice facilitating activities from their chosen curriculum and developing implementation plans and goals. As a result of the workshop, attendees reported increased confidence in their ability to facilitate research mentor and mentee training and to implement research mentor and mentee training at their respective institutions. Furthermore, of the 82% who completed the workshop evaluation, 89% indicated that the training was either "Very Good" or "Excellent" and 90% indicated specific plans to implement research mentor or mentee training within the year. In October 2015, a follow-up survey was sent to the workshop participants from BUILD and non-BUILD institutions to collect data on their mentor and mentee training implementations since attending the workshop. Of the 35 (42%) participants who completed the survey, 32 report having implemented at least one mentor or mentee training since the workshop, totaling 194 mentor and mentee training workshops. From the 194 mentor and mentee training workshops, over 329 mentors and 444 mentees were trained. Data from the BUILD institutions alone is also impressive, with 20 participants reporting implementation of 124 mentor and mentee training workshops, training over 270 mentors and 151 mentees. In the follow-up survey, participants were asked about their implementation barriers and support. The most common barrier to implementation was lack of time. Participants indicated that more institutional support and more incentives for faculty involvement would be helpful. In the follow-up survey, 53% of participants reported that implementation of mentor/mentee training was a recognized part of their job responsibilities, 32% reported that their work environment was very or extremely supportive of their implementing mentee/mentor training, and 53% reported that their work environment was supportive of mentor/mentee training overall. As implementation of mentor and mentee training at BUILD institutions expands, NRMN will continue to offer support to help address these barriers to implementation. NRMN is also working to create additional mentor and mentee training modules, particularly focused on culturally responsive mentoring and mentee training for both undergraduate and graduate students. Additional facilitator training workshops have also been scheduled as part of NRMN's ongoing dedication towards building capacity for mentor and mentee training and promoting productive, supportive and culturally responsive mentoring relationships. Photo: NRMN Facilitating Mentor and Mentee Training Workshop at the University of Minnesota. At the end of the workshop, participants were instructed to raise their hands to indicate how prepared they were to facilitate mentor or mentee training with 1 finger meaning not at all prepared and 5 fingers meaning extremely prepared. Lots of 4's and 5's! Dr. Bluthenthal is a professor in the Department of Preventive Medicine and the Institute for Prevention Research at the University of Southern California (USC) Keck School of Medicine. He received a BA in History and Sociology from the University of California Santa Cruz and a PhD in sociology from the University of California Berkeley. Dr. Bluthenthal's research focus is grounded in public health and community-based participatory research. Having published prolifically, with over 100 articles in journals ranging from American Journal of Public Health to The Lancet on topics focusing around injection drug use and HIV prevention, in 2004 Dr. Bluthenthal received the President's Award from the RAND Corporation. Recently, he presented at California State University Long Beach (CSULB) BUILD's Research Colloquium on trends of injection drug use. His research aims to reduce HIV risk and improve HIV testing among high risk populations. Dr. Grant received her B.S. in Chemical engineering from Brown University, as well as her M.S. and Ph.D., also in Chemical Engineering, from Georgia Institute of Technology. With over 25 years of experience in academia, where she has spent much of her time mentoring students from underrepresented minority groups, Dr. Grant currently acts as the Associate Dean for Faculty Advancement and Special Initiatives in the College of Engineering at North Carolina State University. As a result of mentorship to minority students, Dr. Grant was awarded the 2015 Mentor Award by the American Association for the Advancement of Science. Dr. Zavala graduated from Berkeley with her Ph.D. in Biology. She currently teaches in the Biology Department at California State University Northridge (CSUN) and serves as the Director of CSUN's Minority Access to Research Careers Undergraduate Student Training in Academic Research (MARC U-STAR) program. Dr. Zavala has a long history of advocating for and mentoring underrepresented students. Her mentorship and dedication to increasing the participation of underrepresented minority students in science and technology has earned her recognition with organizations such as SACNAS In 2000, Dr. Zavala received the prestigious Presidential Award for Excellence in Science, Mathematics and Engineering Mentoring which is administered by the NSF on behalf of the White House Office of Science and Technology Policy. 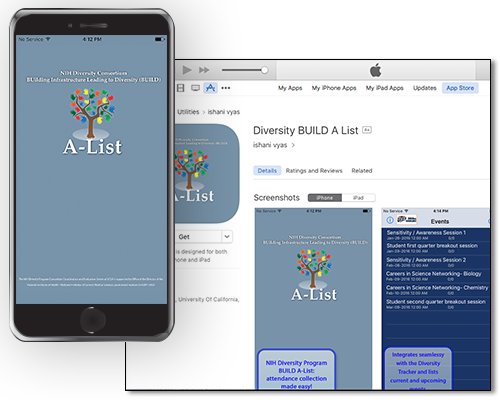 Available for iOS devices, the Diversity BUILD A-List is an iOS app that can be used by institutions participating in the Diversity Program Consortium to track attendance. It is a utility app that uses a magnetic card reader to record attendance. An iDynamo magnetic card reader from MagTek ® is required to make use of this App. There are two versions of this device available: one for older iOS devices (30-pin connector) and one for more recent iOS devices (Lighting connector). To get the app, visit the App Store on your iPhone or iPad, Search for "Diversity A List," and follow the instructions to download. Click here to visit the Apple App Store. For instructions and a user's manual, please visit the support page on the diversity consortium website. This month's Webinar, titled "Understanding Our Baseline: A First Look at Characteristics and Experiences of Entering STEM Students within the BUILD Consortium," was presented by Dr. Kevin Eagan, who is the managing director for the Higher Education Research Institute and who works closely with Consortium sites as part of his role with the CEC. It provided webinar attendees with a wonderful insight into the power of the HERI/CIRP data and how it will be indispensable as sites evaluate programs longitudinally. (Recording will be available here ). The next webinar will be held March 4th. The CEC continues to eagerly await OMB approval and the opportunity to take the lead in gathering data on behalf on the consortium. Following Dr. Eagan's presentation, the CEC is looking forward to the wide array of analyses they will be able to perform both in near and long term. The CEC looks forward to working with all sites in the compilation and sharing of analyses which could help strengthen each program. CEC's main focus this past month has continued to be on CWEP implementation, IRB, and OMB approval. The standing monthly meetings (SMM) with BUILD sites continue to be very helpful in deepening the CEC's understanding of each programs' goals and activities as well as some of the challenges and areas where we can provide some assistance. It has also been great just to continue to build our relationships with our colleagues across the country. The Executive Steering Committee is scheduled to convene February 29th to discuss items related to the 2016 Consortium Annual Meeting, the ESC charter, the Publications and Presentations subcommittee (PPsC) policy, and to finalize the adoption of the Data Sharing Policy. The Chronicle of Higher Education's Vimal Patel covers the inception of the National Research Mentoring Network as an NIH response to the call to create a more diverse workforce among academic researchers across the NIH-funded biomedical sciences. With quotes from NRMN's Drs. Angela Byars-Winston and Jamboor Vishwanatha, notes about the research of NRMN's Dr. Rick McGee, and perspectives from brief interviews of an NRMN mentor and a mentee. Sciencemag.org interviews NRMN's Drs. Rick McGee and Christine Pfund about Dr. McGee's intervention, "Academy for Future Science Faculty," which approaches the task of supporting pairing students by pairing them with mentors unrelated to their thesis work and promoting group meetings. Tthe results of which were published December 2015 in the journal Academic Medicine. LA Times reports that CSU Chancellor, Timothy P. White, calls for "faculty to develop a more inclusive curriculum and to ask the question if we are informing enough about difference, power and discrimination." Or LA Times reports CSU Chancellor Timothy P. White said Tuesday that the California State University system must "empower those who have been disenfranchised." Dr. Parham, who is Vice Chancellor, Student Affairs, as well as an adjunct faculty member at the University of California, Irvine, reports in Diverse: Issues In Higher education that "The Black Lives Matter movement reminds us that, although our campuses are desegregated, students of color continue to experience what many perceive as hostile campus climates"
THINKPROGRESS reports "students were dismissed as "coddled" and "intolerant" as many of them worked to raise awareness about the hostile climate for students of color on college campuses across the country." ASU News reports that Arizona State University, a partner site of University of Texas at El Paso, "has been chosen as a Vertically Integrated Projects (VIP) site joining a multi-university consortium dedicated to increasing the number and diversity of college graduates in STEM fields while also improving graduation rates." The Harvard Crimson reports "Harvard Medical School does not have a diverse enough student and faculty body, a group of Medical School students is charging in a petition they plan to deliver to University President Drew G. Faust." University Business reports that "President Freeman Hrabowski drives University of Maryland, Baltimore County students to diversify the STEM world." EL PASO HERALD-POST reports "Omar Garnica, a researcher at Texas Tech University Health Sciences Center El Paso (TTUHSC El Paso), won a presentation award at the 2015 Annual Biomedical Research Conference for Minority Students (ABRCMS)." WNPR reports "federal efforts to make U.S. health research more diverse aren't going far enough, according to a new study examining nearly 30 years of data from the National Institutes of Health." AFRO reports "A new program at Northwestern University in Chicago is helping to increase the number of underrepresented minority students who go on to pursue careers in science education." EBONY reports "According to Dr. Ramon Goings, Program Coordinator at Sherman STEM Teacher Scholars Program at the University of Maryland, Baltimore County, "In conversations about the importance of Black male educators, the argument is often made that Black males should be in the classroom for their ability to be disciplinarians. However, we must move away from that deficit perspective as Black male educators have the ability to effectively teach all students." Dr. Goings' comment highlights how societal views have only clouded the Black male experience in school settings."